Your abducted daughter leads you to traverse forests, dungeons and more to rescue her. Between you and your goal, hundreds of perplexing traps, savage enemies and taxing obstacles. It’s a tale told before. But something seems… different. Nogalious MSX is a retro inspired action and puzzle platformer from Luegolu3go Studios (Website, Facebook, Twitter). In it players guide Nogalious through five different levels, overcoming the many challenges, and facing off against the evil Darama – all thanks to the glory of MSX emulation. If you are a little confused because this game looks familiar, and yet doesn’t, that’s okay. Nogalious first appeared on Kickstarter, and was fully funded in November 2017. In August 2018 the original version of Nogalious became available on Steam. 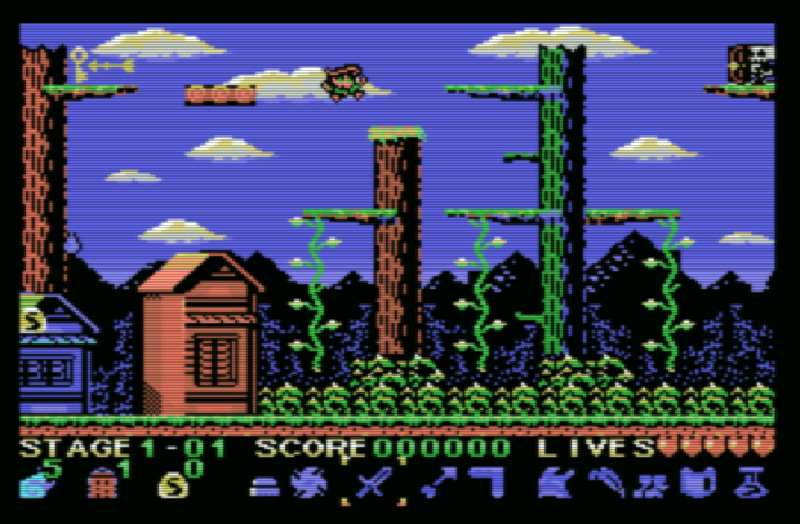 A number of alternate versions were also created, taking the base game and applying it to classic systems, with Nogalious MSX being one of them. This is important to understand; Nogalious MSX is not a straight port, but a reinterpretation of Nogalious on a system with very particular considerations. Still, the fundamental creative building blocks are the same. 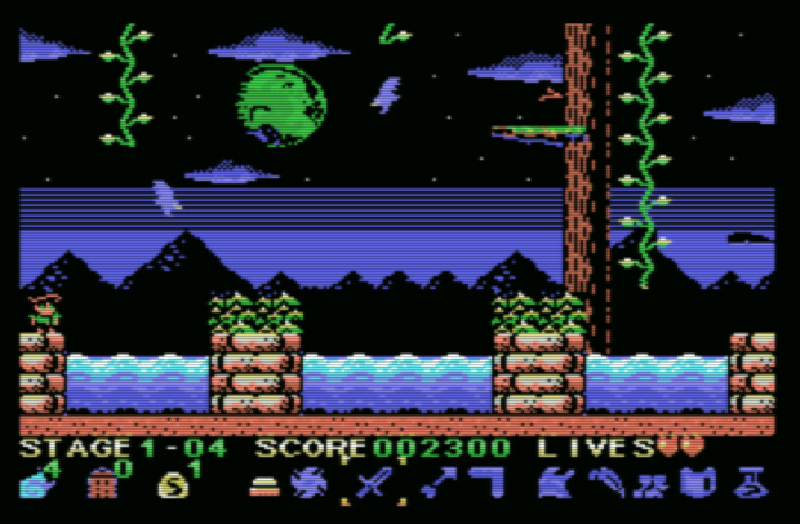 As such this review focuses on taking Nogalious and applying it to MSX hardware. Considering this game as a complete separate entity from Nogalious would do a disservice to the developers’ work. Those who are familiar with the MSX will know that it has some, for the lack of a better term, unique attributes; this applies to both in how the computer system operates, as well as the computer’s physical design. These are all quirks which Luegolu3go Studios have had to work in, or around, to adapt Nogalious to the system. From a technical standpoint they have done an incredibly impressive job. Looking at Nogalious MSX and the original Nogalious (Steam link) side-by-side, the games are comparable but not identical. Level layouts and progression follow the same flow; though because of considerations like screen size and processing power, some elements have had to be shuffled around. But the essence of the Nogalious levels have been kept intact. So too the sprites have pronounced similarities, although the MSX versions are incredibly simplified. In most cases this works, though some enemies do suffer for their lower detail. In some cases there will be portions where enemies disappear, as they almost blend into the background. This makes them that much harder to deal with. The controls are where things get dicey. Nogalious has a fairly tight control response, and straight forward default controls. Nogalious MSX feels a lot looser, making finer movements more challenging to perform, such as jumping toward and grabbing a series of vines. If you are familiar with some of Nogalious level designs, this can make even the earliest levels way more challenging. Because this is faithfully emulated, sprites occasionally flicker. This can happen at the most inopportune of times. But it is a characteristic of the system, and points more towards the developer’s insistence on working within the constraints rather than it being a major problem. It is worth noting that the entire game runs from an emulated ROM, via OpenMSX. As such the game itself doesn’t have a lot of setting options. There is the ability to go into the emulator menu, but this isn’t for the uninitiated. Being run via an emulator also means that, in some cases, Steam functionality is lost such as taking screenshots, or bringing up the Steam overlay. Nogalious MSX is a really intriguing oddity in that it plays totally into both being a fairly faithful recreation of an existing title as well as leaning into the limitations of a retro computer system. As such the game is really only for those interested in reliving the MSX, or are such fans of Nogalious that they are looking for a particularly unique challenge. For those unfamiliar with the system, or emulators in general, there is probably too steep a learning curve to garner much enjoyment or replayability. Nogalious MSX is developed and published by Luegolu3go Studios. It is available now on Steam.